A bold, inventive and remarkable retelling of Hamlet produced by Why Not Theatre opened Thursday at the Berkeley Street Theatre. It is a remounting of a successful run in 2017 at The Theatre Centre in Toronto. The classic tale is invigorated with a gender bent cast and a bilingual component. 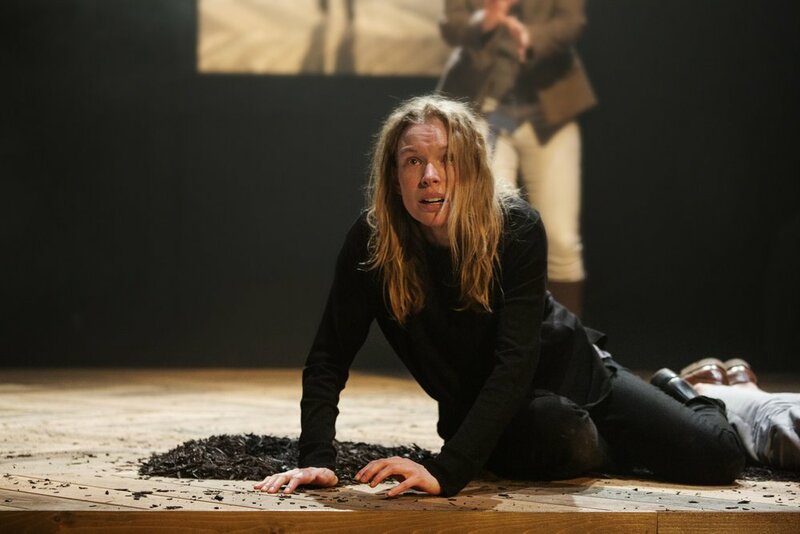 Gender reallocation is not an entirely new format to Shakespeare audiences – consider Stratford Festival’s recent Julius Caesar or Prospero. Shakespeare himself experimented with men playing women playing men – consider Portia or Viola. What is more unique and creative is the combination of the spoken word and American Sign Language which elevates this production in profound new ways. The use of signing has two effects – most importantly, it brings the story to a deaf audience. Secondly, it adds a brilliant dimension of intensity to the emotion –packed story. Along with Ravi Jain, as director and adapter, Dawn Jani Birley is the anchor of this production. Playing Horatio exclusively with sign language, she is the main storyteller acting as part conductor, part choreographer, and part Greek chorus. Her signing brings physicality to the emotion and her brilliant facial expressions supplement both angst and humour. We virtually see Hamlet’s ghost in Horatio’s eyes. Jain’s careful direction blocks Horatio for remarkable effects: He may be very close to a speaking actor such as when he mocks the foolishness of Polonius. Other times he may be on the opposite side of the stage giving a distant echo of Hamlet’s signature soliloquy. Often he is in the centre of the stage almost manipulating strings connected to the chaos swirling around. Some of the most haunting images, though, are when Horatio is alone on the stage, silent and signing, echoing and extending the vicious complexity of emotions. Ms. Birley gives not only an athletic performance (signing is physically demanding) but also a soulful performance that demonstrates in a beautiful new way the intimate relationship between best friends Hamlet and Horatio. Christine Horne, an award winning actor, is equally remarkable as Hamlet. The demanding role becomes even more demanding as she switches from signing to speaking and often doing both. Her frenetic energy matches the complexity of Hamlet’s conscience. She moves smoothly from intense self-examination to wicked sarcasm. Again, the signing becomes a physical extension of her emotional turmoil. Highlights include scenes where Hamlet does the ghost’s lines – the “swear” scene is brilliantly choreographed and enhanced with Ms. Horne’s physical skills. Nuance and timing is well-defined, especially in her scenes with Horatio – in one scene the audience is about to mouth the signature line “to catch the conscience of the king,” but instead they both sign it together which gave it great impact. Thomas Ryder Payne’s soundscape is not just a background enhancement – it is almost another character in the play. It is continuous except for brief moments of stunning silence. It can be raucous and extreme such as during the sexual scenes with the King and Queen. It is sometimes a single drum beat reflecting horror or a solemn bell – funereal and lonely. With a minimalist set, Andre Du Toit’s lighting design is bold with sharp angles drawing the audience into the darkness of the castle or a ship or brightly exposing faces of horror. A highlight is Claudius’s speech in the church where the shadows of Horatio’s signing appear on the guilty King’s back. Although the set is stark, designer Lorenzo Savoini places three massive mirrors upstage on an angle which enhances lighting effects and gives not just the characters, but also the audience a sense of introspection. The cast rounds out with a number of brilliant performances and resonating scenes. Miriam Fernandes stands out with comic wit as Rosencrantz and with fun improvisation as the grave digger who discovers a new singing talent at the bottom of a bucket. Jeff Ho is a standout as Ophelia believably sinking slowly into madness. Hanna Miller brings a comic element as Guildenstern, especially with a brilliant scene where an argument with Hamlet and Horatio turns into a send up of awkwardness between the hearing and the deaf and how to interpret signing. Creative stagecraft augments many scenes. The “helping hands” turn, always found in Improvisation 101, could have seemed stale but blends brilliantly as the “hands” get mixed up in the signing. The comic venture underscores the power of sign language in both serious and comedic situations. Some wandering of actors around the periphery of the main stage seemed distracting at times – taking away from the main event. However, this cast, crew and creative team should be proud of a brilliant production which is dependent on strong acting, voices, and hands. A typically noisy and exuberant ovation broke out as anticipated, until it naturally changed as the audience quieted and then excitedly waved hands and fingers in silent tribute. The Bard himself would have been impressed with the deafening silence. Runs at: Canadian Stage Berkeley Street Theatre – Toronto, Ontario. February 6 to 24, 2010.